The UCI hopes to prevent mechanical fraud, and new technology allows it to leave no bike unscanned. Team Sunweb’s Tom Dumoulin was livid on the Bardonecchia summit at the end of the race-breaking stage that decided the 2018 Giro d’Italia. Journalists packed in around the Dutchman to get his take on Chris Froome’s epic 80-kilometer breakaway, but he wasn’t having any of it. Had someone just swiped the reigning world time trial champion’s bike? Yes and no. Dumoulin’s bike was gone, but it wasn’t a fan with sticky fingers. Instead, the bike had been whisked away for X-rays. The 2018 Giro d’Italia was historic for many reasons. The “Big Start” in Israel and Chris Froome’s controversial attack over the Colle delle Finestre stand out, but the race was significant for another reason. The UCI deployed new X-ray technology that it says will assure the public that no riders are using illicit motors to power up Europe’s steepest and longest climbs. NOT FAR FROM BARDONECCHIA, over the Alps and across Lake Geneva, Jean-Christophe Péraud was watching with interest from the UCI headquarters in Switzerland. The French ex-pro — who retired at the end of 2016 after a long racing career that included Olympic medals and Tour de France podiums — was the man who ordered Dumoulin’s bike be tested that day. Péraud’s official title is Manager of Equipment in the Fight Against Technological Fraud. You can just call him the UCI’s man on an X-ray mission. The push against mechanical doping was one of the major campaign platforms of newly elected UCI president David Lappartient. The Frenchman was quick to move, and within six months of his election in 2017, the UCI rolled out ambitious plans in March. Central to the effort is a specially designed mobile X-ray machine. It was trundled from stage to stage across the Giro on the back of a small trailer. Developed by U.S.-based VJ Technologies, it was first used during the spring classics. The device, which was discretely tucked near the anti-doping control area at each stage of the Giro, allows a full bike, with both wheels mounted, to be slid between X-ray panels. The self-contained unit is safe to use and does not emit dangerous rays, the UCI said. The X-ray and review process take about five minutes. Giro organizers didn’t take it to Israel, but from stage 4 in Sicily to the final stage in Rome, post-stage X-rays became part of the protocol. RUMORS OF MOTOR-DOPING have circulated for years in pro cycling, but thus far no elite male pro has ever been caught. That hasn’t stopped conspiracy theories from taking root. The most famous involves Fabian Cancellara during the 2010 Tour of Flanders. Other videos of seemingly magically spinning wheels, including one involving ex-pro Ryder Hesjedal during the Vuelta a España, also have gone viral. Those rumors turned into a shocking reality in early 2016 when a motor was discovered in the spare bike of 23-year-old Belgian cyclocross racer Femke Van den Driessche during the world championships. The scandal fueled rumors that hidden motors were rampant in elite road racing. Under former president Brian Cookson, the UCI first introduced scanning technology and brought a large X-ray machine to select races. Lappartient defeated Cookson in the 2017 UCI presidential election in part campaigning on the dangers that motors present to professional racing. As technology improves, especially with lighter and more functional motors as part of the booming e-bike market, Lappartient wants to be in front of the curve. The effort began this spring. Bikes were X-rayed starting at E3 Harelbeke and continuing at all the major races until Liège-Bastogne-Liège. Bikes are also being tested at the women’s WorldTour and some junior races as well. The UCI had a high-profile presence throughout the Giro. 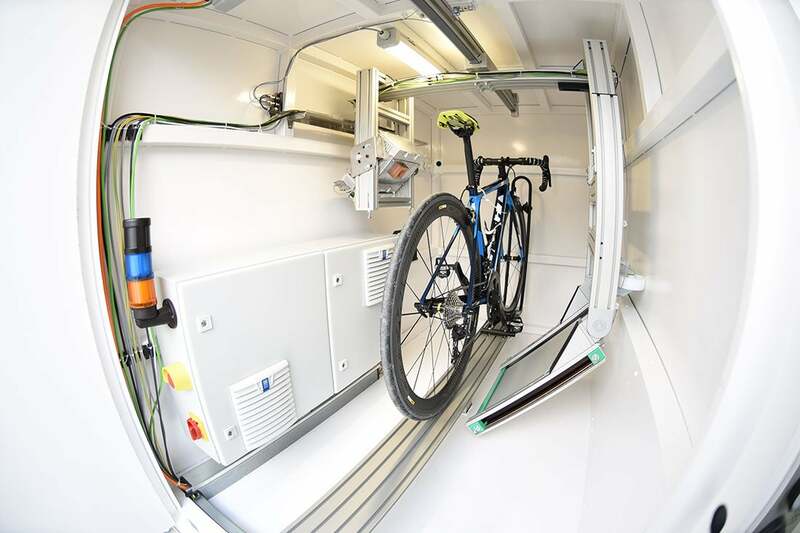 Not only did the governing body roll out its fancy mobile X-ray machine, it also continued deploying its iPad scanning devices as well as thermal-imaging cameras unveiled at the Tour de France a few years ago. At the Giro, the peloton acted with a mix of incredulity and amusement at the notion of their bikes being X-rayed. The UCI promises to be as vigilant through the remainder of the racing season. 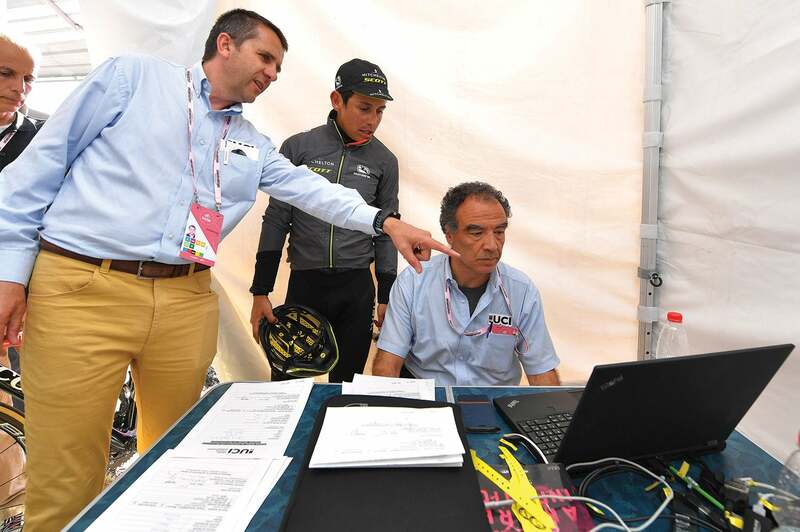 The X-ray device, as well as the other detection technology, will be deployed at the Tour de France, the Vuelta a España, the road world cycling championships in Innsbruck, and Il Lombardia. The UCI also promises to use it at selected track, mountain bike, and cyclocross events across the calendar. CHRIS FROOME’S BODYGUARD EXPERTLY slipped through the finish line chaos after the final mountain stage of the Giro d’Italia. It wasn’t easy to match the handler’s pace as he weaved past journalists, soigneurs, riders, and even a few overzealous fans packed onto the narrow road in the shadow of the Matterhorn. It was odd to see the bodyguard walking briskly away from his star client just as Froome was receiving kisses from the podium girl. What was the rush? Froome’s bike had been selected for testing. Just as when a rider is selected for a doping control, when a rider’s bike is selected for testing, he is immediately joined by a chaperone when he crosses the finish line. A UCI commissaire targets the bike after the racer dismounts. The commissaire affixes a color-coded band to mark it for testing, to assure the line of custody, and guarantee that the bike cannot be switched. The bike is then carried into the testing area. The commissaires were busy on the Cervinia summit, checking several bikes, including the top three racers on GC as well as the top three riders on the stage. Teams are only privy to their test results, and in the evening the UCI releases details of how many bikes were X-rayed and how many were scanned with the iPad. And what happens if they detect a motor? According to the UCI, the bike would be dismantled to confirm the finding. The rider would be immediately excluded from the race and a disciplinary case would be opened for possible fines and sanctions. THE UCI HASN’T HIDDEN the fact it is testing for motors. That’s its first line of deterrent — if you know you’re being watched, you might not be tempted to cheat. The finish-line checks at the Giro were usually picked in coordination with the day’s anti-doping controls, which meant the day’s winner and a few random bikes were checked. Some days it was more. On the stage 16 time trial, for example, they checked a total of 12 bikes. Froome’s bike was tested on all the key stages of the 2018 Giro, including after winning at Monte Zoncolan, and in Bardonecchia and Cervinia. The UCI is hoping its efforts will help to end the notion that Froome and the other top pros are winning the sport’s biggest races with special assistance.